Ah, LEGO... one of my personal favorite toys from my childhood. LEGO is arguably one of the best toys for children because it enables them to create and truly use their imaginations; instead of dictating what world the mind can play in, it encourages us to create our own. So naturally when I found out that LEGO was releasing a game based on their build-a-board-game Creationary, I was a little excited. It made me think of fond memories of Lego Island from my youth - 3D LEGO games definitely have potential to be serious fun. 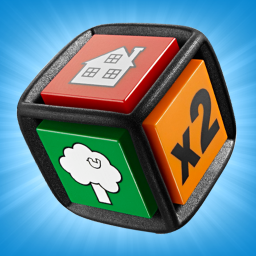 Creationary plays a lot like the classic board game Pictionary, in that you're given a time limit to guess what is being created in front of your very eyes. In this case, however, the object is rendered in LEGO bricks instead of on paper, and you have four possible choices instead of having to wonder (often aloud) what the object is. 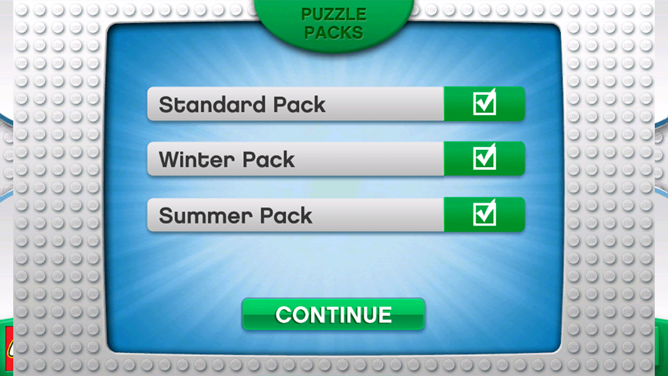 The themes of the puzzle are dictated by Puzzle Packs; there are only three available right now, between Standard, Summer and Winter. Really, there isn't too much of a thematic difference besides the objects that are created. It would be a bit more comprehensive if it gave you a re-skinning option, or something that at least indicated what pack you were playing. As of right now it's just all guesswork. The game really feels unfinished; with only three puzzle packs to choose from, I almost assumed that they'd try to offer some as DLC. However, what you see is what you get. While I haven't seen any repeated puzzles yet, there have been some instances where the possible results have been the same. 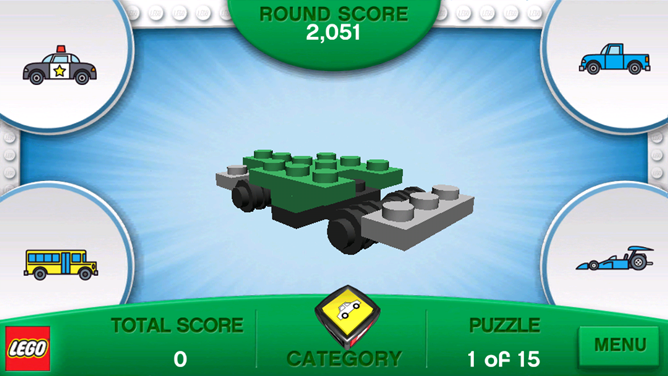 This is a bit frustrating, because isn't the point of LEGO to be creative? Also annoying is the difficulty. It isn't clear that you're supposed to have guessed the construct by the time it's done building, and the same has a tendency to throw things that look incredibly similar at you, flunking you if you wait too long for that crucial piece. 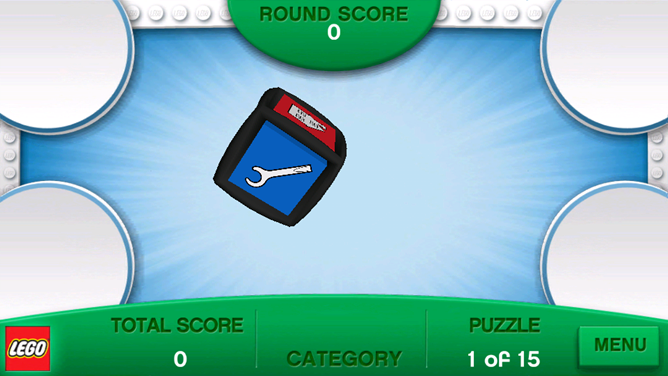 An example of this is the raygun and hand drill: both look almost exactly like the other, and the only reason I didn't fail the puzzle before time ran out was because of a lucky guess. Since the possible answers are shown as cartoon images but the actual construct is rendered in LEGO bricks (as shown in the image above right), it can be hard to see the resemblance. Sometimes you'll be left scratching your head, saying "that's a cat!?" and swearing you could build better. This is a bit of a problem early on, but it goes away with time as you begin to think more abstractly. Other problems include the inability to disable the screen timeout while playing, meaning you constantly have to touch the screen in an effort to keep the game alive. That's a really simple design oversight that bugs the heck out of me, as my phone's set to a 15 second sleep; sometimes the game will turn itself off before the loading's even done. Ultimately, these aren't problems that "break" the app, but they are problems that cause a bunch of minor annoyances that you can't overlook. However, the app's main audience might not be so quick to judge, as they tend to have a lot more patience for these things than we do. I can see this being a hit with the younger people in your life, and who knows? It might inspire you to crack open that big tub of bricks you have somewhere in your attic. 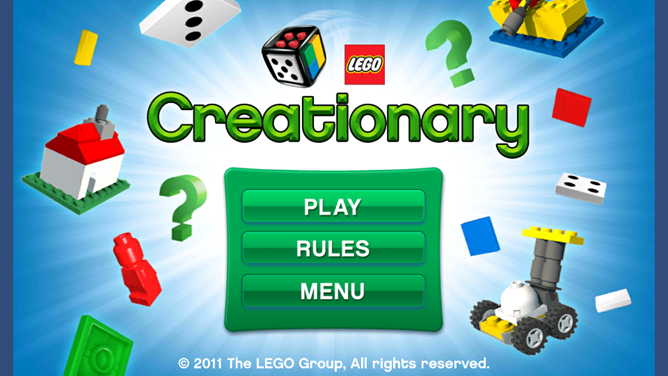 Creationary is a free download, and is great for when you need to entertain younger siblings/relatives/children. However, older LEGO fans might be a bit disappointed.